Sky has invested $5 million (£3.1 million) in the native advertising technology company Sharethrough. Sharethrough’s software provides advertisers with an automated system that matches online ad campaigns to the web pages they are appearing on, enabling publishers to monetise platforms and apps. The investment follows an earlier arrangement between the two parties, whereby Sky worked with Sharethrough to offer native advertising on skysports.com. Sky’s ad sales house, Sky Media, will offer clients access to Sharethrough’s software and will also use the software itself to market its own products and services. Under the terms of the deal, Jamie West, deputy managing director of Sky Media, will take a board observer position at Sharethrough. West spearheaded Sky’s AdSmart offering, which delivers household-specific TV ads. The investment is the latest for Sky in a series of US technology companies, including the IP streaming service provider Roku, 360 video specialists Jaunt and video delivery firm 1 Mainstream. Earlier this year, Sky opened an office in San Francisco to enable it to identify and work with tech start-ups. Sky’s investment in Sharethrough forms part of a wider US $10 million (£6.2 million) funding round. West said: "This investment in Sharethrough builds on our leadership in advertising innovation, which we’ve already established with Sky AdSmart, enabling us to offer even more options to advertisers on Sky." Dan Greenberg, founder and chief executive of Sharethrough, said: "Partnering with Sky is our latest step in advancing Sharethrough’s vision to help publishers around the world find new revenue streams across all platforms, especially mobile. "There is already a rapid shift towards native, in-feed monetisation as a key revenue driver for all publishers in all markets. 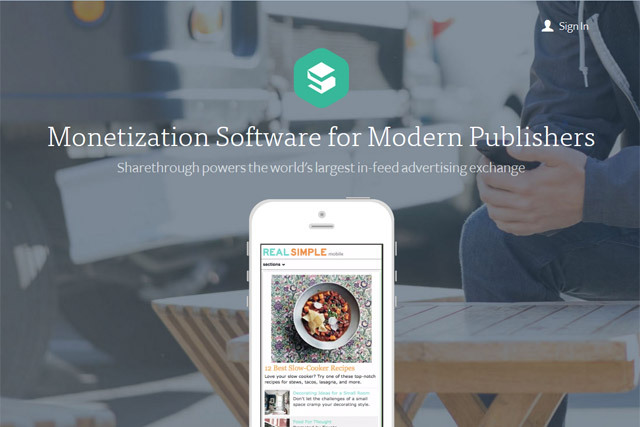 Our industry-leading software will enable publishers and their brand clients to deliver content programs at scale."